In the SUV segment the BMW X5M F85 SUV is the ultimate solution for driving pleasure. 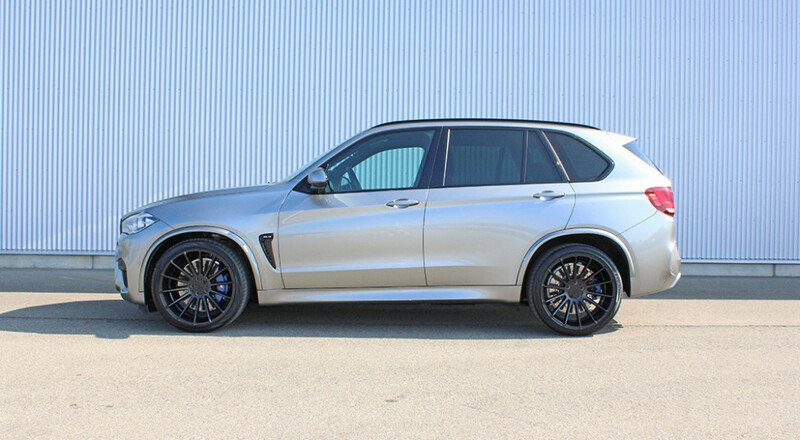 The X5M tuning from Hamann includes all areas of classic vehicle tuning. Starting with use of carbon parts, combinations of light alloy wheels, and extending to performance enhancements with a complete reworking of the vehicle’s engine electronics with our signature engine characteristics, the X5M fan finds everything that friends of vehicles from the Bavarian capital could desire. The Hamann muffler systems with 4 tailpipes also discreetly impart the BMW X5M performance enhancement to the fan acoustically. Never loud, yet nonetheless always present acoustically, they give the driver an immediately perceivable impression of load status and power-train rpm at all times. If need be, the sport exhaust systems can be combined with optimized Y-pipes left and right that have high-quality and efficient catalytic converters with 300 cells per square inch. The basic vehicle, the BMW X5M in standard condition is already more than properly motorized with 575 hp / 423 kW and a maximum torque of 750 Nm at 2200 – 5000 rpm, however with its tuning package Hamann provides a significant supplemental boost: With the BMW X5M performance enhancement capacities of up to 640 hp/ 471 kW are possible as part of the X5M tuning. The broad range, in which the maximum torque of what is now 840 Nm is applied, does not change at 2200 – 5000 rpm compared to the factory standard basic vehicle; this has an extremely positive effect on the daily usefulness of the performance-enhanced vehicle. In the area of aerodynamics parts, Hamann has something quite special in its offering with the 100% genuine carbon hood in black: The X5M carbon hood crafted in visible carbon fiber is available with and without parts certificate, depending on customer request and licensing requirements. In any case, the Hamann X5M carbon hood has a power dome and lateral ventilation slots that not only have an outstanding visual effect, they also effectively contribute to the performance enhancement of the vehicle. A variety of wheel and tire combinations in both 22-inch and 23-inch ensure a befitting appearance of the Hamann-BMW X5M that is instantly recognizable. The lowering kit not only brings the vehicle closer to the road and convinces through sporty dynamism with full retention of daily utility, it also gives others an impression of the solid performance that the BMW X5M F85 is capable of unleashing at any time. Additional accessories such as an exclusive set of mats, the pedals in aluminum design or the silver anodized footrest round out the offering for the BMW X5M F85.